Brambles Limited is a supply-chain logistics company operating primarily through the CHEP and IFCO brands. Brambles is listed on the Australian Securities Exchange (ASX) and has its headquarters in Sydney, Australia, but operates in more than 60 countries, with its largest operations in North America and Western Europe. Brambles enhances performance for customers by helping them transport goods through their supply chains more efficiently, sustainably and safely. The Group's primary activity is the provision of reusable unit-load equipment such as pallets, crates and containers for shared use by multiple participants throughout the supply chain, under a model known as "pooling". Brambles primarily serves the fast-moving consumer goods (e.g. dry food, grocery, and health and personal care), fresh produce, beverage, retail and general manufacturing industries, counting many of the world's best-known brands among its customers. The Group also operates specialist container logistics business serving the automotive sector. At 30 June 2016, the Group employed more than 14,500 people and owned more than 550 million pallets, crates and containers (after provisions) through a network of more than 850 service centres. Brambles is also a 50:50 partner in the joint venture company, Hoover Ferguson Group, which is a global provider of container logistics solutions to the Oil & Gas and Chemicals sectors. See www.hooverferguson.com for more information. In August 2016, Brambles entered into an agreement to merge its Oil & Gas containers business unit with leading containers solutions provider, Hoover Containers Logistics Solutions, to create an independent joint venture company ­­–­­ Hoover Ferguson Group (HFG), to be 50% owned by Brambles. The transaction is expected to complete in October 2016 (subject to regulatory clearance and customary conditions precedent). Brambles enhances performance for customers by helping them transport goods through their supply chains more efficiently, safely and sustainably. The Group’s primary activity is the provision of reusable pallets, crates and containers for shared use by multiple participants throughout the supply chain, under a “sharing and reusing“ model also known as “pooling“. Under various pooling models, Brambles provides standardised reusable pallets, crates and containers to customers from its service centres, as and when customers require. Customers then use that equipment to transport goods through their supply chains, and – depending on the specific pooling model in operation – either arrange for its return to Brambles or transfer it to another participant in the network for that participant’s use prior to its return to Brambles. By participating in Brambles’ pooling system, customers eliminate the need to purchase and manage their own unit-load equipment, thereby reducing the capital requirements and complexity of their operations and simultaneously reducing waste from their supply chains. Customers benefit from the shared scale efficiencies generated by Brambles’ network and systems, as well as the Group’s asset management knowledge and development of additional value-adding services, products and solutions. Brambles generates sales revenue predominantly from rental and other service fees that customers pay based on their usage of the Group’s equipment. Brambles retains ownership of its equipment at all times, inspecting, cleaning and repairing them as required to maintain appropriate quality levels. We always act with integrity and respect for the communities in which we operate and the environment. Disciplined capital allocation for long-term growth: In addition to funding its established businesses, Brambles seeks to allocate capital to organic business opportunities or acquisitions where the Group believes its specific supply-chain expertise can add value for customers and create value for shareholders. The dynamic nature of the supply chains Brambles serves, provides the Group with a broad range of growth opportunities including: increasing penetration of core equipment-pooling products and services in existing markets; diversifying the range of products and services; entering new and adjacent parts of existing supply chains; expanding into new supply chains or geographies; and/or exploring the digitisation of supply chains. Brambles’ relative competitive position is defined by the scale and density of its pooling networks, and the additional services and value these networks enable the Group to provide to customers. This concept is also referred to as Brambles’ “network advantage“. Over time, Brambles’ network advantage is strengthened through the disciplined expansion of its pooling networks and accompanying investment in customer service, creating a sustainable competitive advantage that enables the delivery of attractive returns to shareholders. 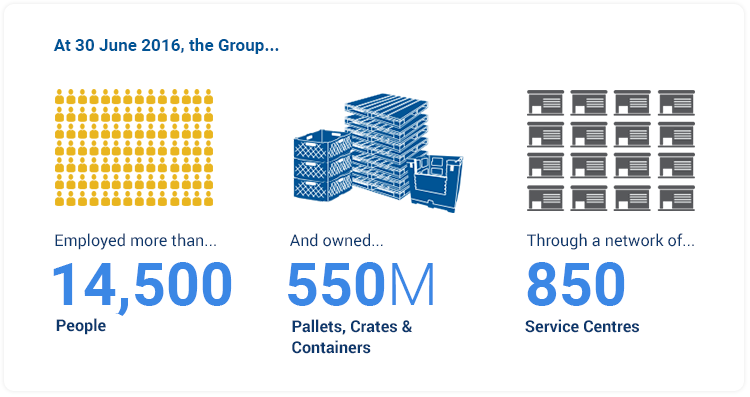 The scale of Brambles’ established operations and customer relationships provides the Group with unique access to additional customer growth opportunities. Over the past five years, Brambles has consistently outperformed the benchmark Australian share index, the S&P/ASX200 Index, by delivering superior rates of profitable growth and shareholder returns. Based on Bloomberg data for the five years ended 31 December 2015: Brambles’ compound average growth rate in sales revenue was 5%, compared with 2% for the S&P/ASX200 Index, and Brambles’ average post-tax return on capital was 16%, compared with 4% for the Index. In the 2016 financial year, Brambles’ delivered a total shareholder return of 20%, compared with 1% for the S&P/ASX200 Accumulation Index and 19% for the S&P/ASX200 Industrials Accumulation Index. On a five-year basis, Brambles’ total shareholder return has been 115%, compared with 43% for the S&P/ASX200 Index and 78% for the S&P/ASX200 Industrials. While there is no guarantee that these absolute or relative returns will continue, Brambles believes that superior execution of its strategy will enable continued strong performance. The Group monitors performance and value creation through non-financial metrics (such as customer loyalty, safety performance and employee engagement and enablement) and through financial metrics (such as sales revenue growth, profitability, return on capital and shareholder returns). Depreciation, as well as provisioning for lost or otherwise irrecoverable pooling equipment. Brambles defines Return on Capital Invested as Underlying Profit divided by Average Capital Invested. The main driver of Average Capital Invested is capital expenditure on pooling equipment, which is primarily influenced by the rate of sales growth and by asset efficiency factors, i.e. the amount of pooling equipment not recoverable or repairable each year (and therefore requiring replacement), and the frequency with which customers return or exchange pooling equipment. Brambles’ main capital cost exposures are raw materials, primarily lumber and plastic resin. The Group also monitors Brambles Value Added, which measures value generated over and above the cost of capital used to generate that value. Brambles Value Added is calculated by subtracting from Underlying Profit the product of Average Capital Invested multiplied by 12% (a notional representation of pre-tax cost of capital). Brambles believes its operating model is inherently sustainable. By promoting the reuse of assets among multiple parties in the supply chain, Brambles’ sharing and reusing operating model creates more efficient supply chains by reducing operating costs and demand on natural resources. Brambles’ sustainability framework organises the Group’s sustainability activities in three areas: Better Business, Better Planet and Better Communities. 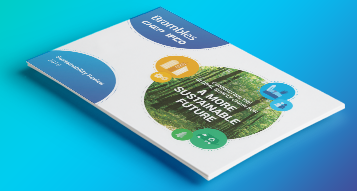 During FY16, this framework was enhanced through the release of Brambles’ 2020 sustainability goals. 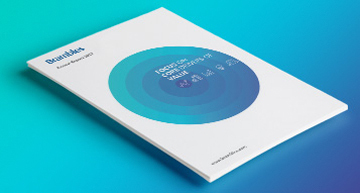 These goals focus on the strategic sustainability issues that preserve and create value, while managing actions that reduce the impacts of the Group’s operations on the environment and communities in which it operates. Brambles’ 2020 sustainability goals were mapped to the United Nations Sustainable Development Goals (SDGs) released in 2015. The Group’s goals were established through internal consultation with Brambles’ businesses and input from customers, suppliers, peak industry bodies and sustainability practitioners. During FY16, Brambles’ management established a sustainability risk committee whose primary function, is to identify, assess, monitor and report on the Group’s exposure to sustainability risks and determine whether the exposure to these risks is material. In FY16, Brambles’ sustainability risk committee conducted a review of material sustainability risks and issues, recognising: previously identified material sustainability issues; the third edition of the ASX Corporate Governance Principles & Recommendations, particularly Recommendation 7.4 concerning economic, environmental and social sustainability risks; and the Global Reporting Initiative’s G4 reporting framework. Safety: Brambles’ Zero Harm Charter states that everyone has the right to be safe at work and to return home as healthy as they started the day. Brambles measures its safety performance through the Brambles Injury Frequency Rate (BIFR), which measures work-related injuries, fatalities, lost time, modified duties and incidents requiring medical treatment per million hours worked. Brambles’ met its target of year-on-year improvement in the BIFR rate in FY16, recording a BIFR of 9.7, an improvement from 13.3 in FY15. This result reflects continuous improvement in the safety culture of Brambles. Brambles’ Zero Harm Charter and safety targets align with SDG 3 Good Health and Wellbeing. Further details of Brambles’ sustainability framework and new sustainability goals are located on Brambles’ website. A full review of Brambles’ sustainability risks and performance will be included in the Group’s Sustainability Review, scheduled for publication in October 2016.